Connor McDavid and Zack Kassian took advantage of a sputtering San Jose Sharks power play to score two short-handed goals in the Edmonton Oilers' 2-0 win on Friday. The victory evens the best-of-seven Western Conference quarter-final series at one game apiece. Game 3 goes Sunday night in San Jose. Kassian scored early in the second period and McDavid notched the insurance goal midway through the third period. It was a dominant performance by the Oilers and particularly by Kassian, a fourth-line winger. Kassian drove the net effectively and delivered bone-jarring hits on Sharks' Brenden Dillon and Logan Couture at Rogers Place. By the end of the second period fans were chanting "Kass-ee-ann! Kass-ee-ann!" "As a group we wanted to have a good bounce-back game," said Kassian. "It was one of those things, the puck seemed to follow me tonight. My linemates played well. We brought a lot of energy." "He dominated the game tonight. He was a physical presence, scored a huge goal for us. It was his show tonight," said McDavid. It was a reversal of Game 1, when the Oilers were outshot 44-19 en route to a 3-2 overtime loss. This time the Oilers kept their foot on the gas pedal, outshooting and outhitting the Sharks throughout the game. Oilers goaltender Cam Talbot faced few quality scoring chances en route to the shut out. 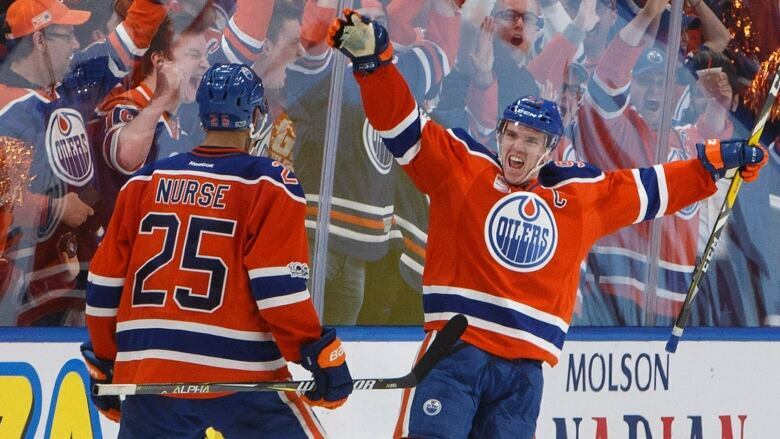 It was Edmonton's first playoff win since the spring of 2006. They had missed the playoffs for 10 consecutive seasons prior to this year. Kassian scored 42 seconds into the second frame when Sharks forward Joe Pavelski lost control of the puck at the Oilers blue line. He swiped at the puck with this stick, giving it to Oilers Mark Letestu. McDavid, the NHL's regular-season scoring leader, scored his first NHL playoff goal at the 10:31 mark, streaking down the left side and launching a shortside wrist shot that eluded Jones. The Sharks were 0 for 6 with the man advantage and are 1 for 12 through the first two games. San Jose's power play was ranked 25th in the NHL in the regular season at 16.7 per cent. "We're disappointed with the way it went," said Sharks forward Joe Pavelski. "We got what we probably deserved out there." The Sharks' power play has suffered from the absence of dominant centre Joe Thornton. "Guys might have been nervous the first game. I definitely felt a little bit of nerves in the first one. Guys just played comfortable [this time], played more of our style of game," he said.